Posted in challenge, FingerFood Theme Buffet, Manicures, Nail Art, pictures	by Jessica W.
To get me in the spring mood, I have some spring stripes today. I’ve started off with 2 coats of ellagee Milk Glass. This was the perfect starting point, because I wanted an opaque white polish as a base. Then after applying striping tape, I used Jessica Sharktooth on top. Then, I added another stripe going across the other stripes with Jessica Monsoon Melon, topping it all with Glisten & Glow’s HK Girl. The striping is gorgeous :O, love it! It turned out great! I like that bold stripe of color on the side, it adds a nice touch of color to the mani. This is so lovely, all the colors look great together! I love how the white stripes turned out! So clean and lovely. 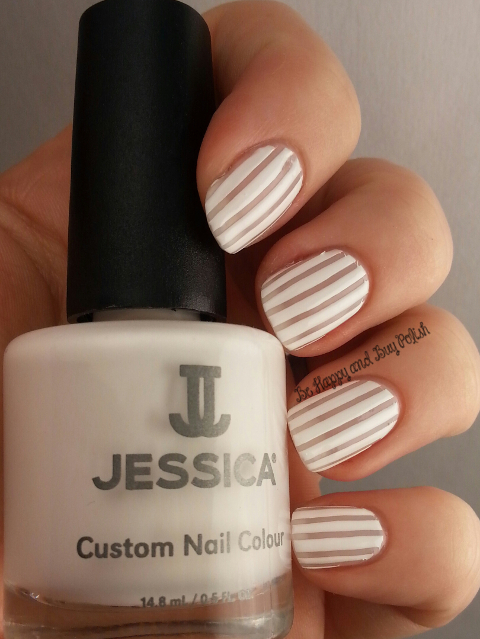 Beautifully done Jessica! Oh I really love these for spring! And I love that bright pop of color 🙂 Well done! These are beautiful ❤ I love the soft and subtle stripes with a pop of color. This manicure just looks so sophisticated!